Prince of Persia creator Jordan Mechner and Michel Ancel, the man behind the Rayman series, discuss narrative vs. gameplay, and drop a few hints about Beyond Good & Evil 2 in the process. The discussion, which you can see in all its blurry glory on the right, was held at the Montepellier in Game 2011 game show in Montpellier, France. Naturally, the entire conversation was in French, but the scholars over at IGN did a little translating. According to IGN's translation, BG&E 2's artists are drawing major inspiration from modern India. The concept art, which is the first look we've had at anything BG&E2 related since that target render that was leaked back in 2009, seems to confirm that. Apparently, the design team was flown out to India in order to help them capture a specific "mixture of tradition, the future, and everyday life." There's still scant concrete details on BG&E's development, save that it's not canceled and aiming for release sometime during the next console generation. Ubisoft Sales VP Tony Key recently joked that lead designer Michel Ancel would have more leeway to work on the game if his current project, Rayman Origins, sold well. 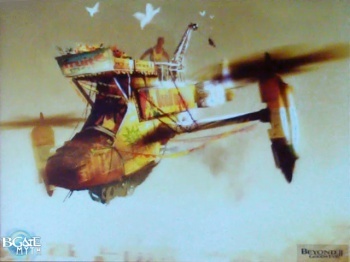 You can peruse the slightly blurry collection of concept art, and watch a video of the discussion, assuming your French is up to snuff, here.